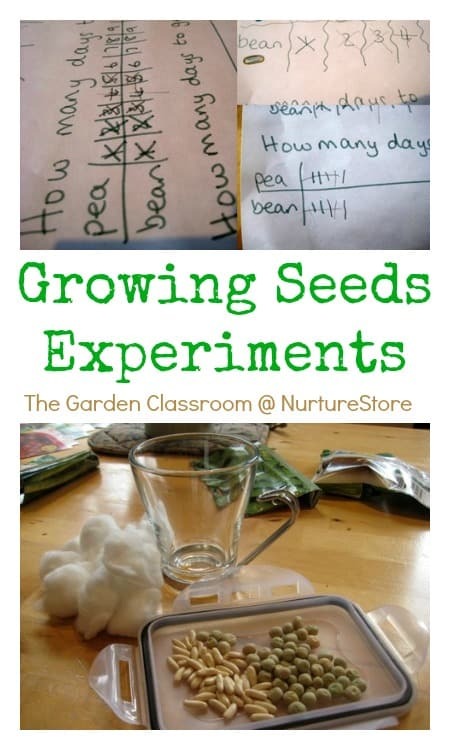 In this growing seeds experiment we’ll be investigating seeds, and comparing bean and pea seeds as they germinate and begin to grow. 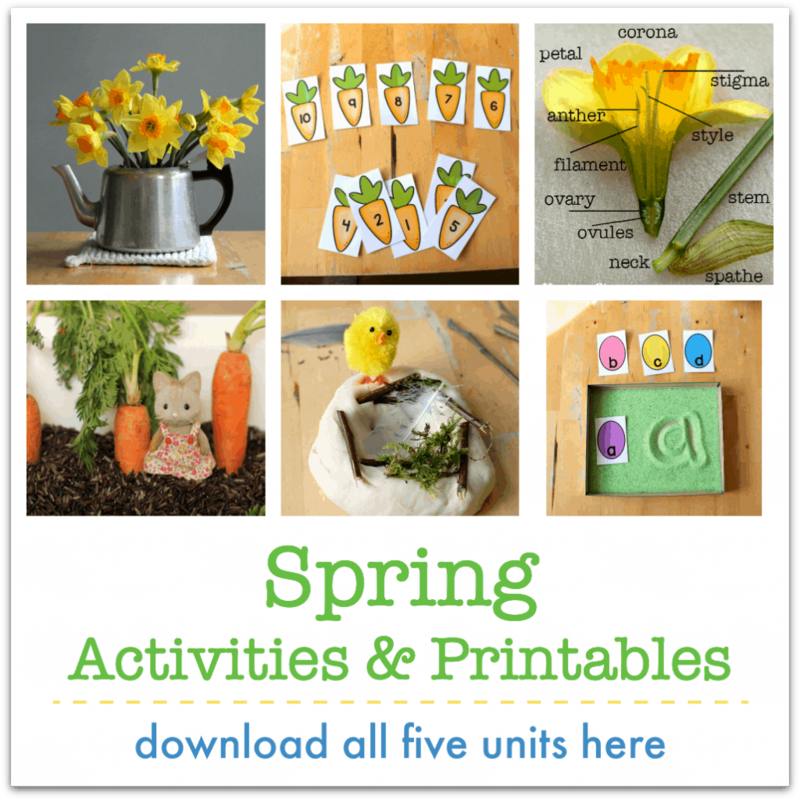 If you joined in with our earlier gardening activity your children will have had lots of experience with planting seeds. The first exciting stage of the growing action takes place below the ground though, which children don’t usually get to see. Today’s experiment will give them a window underground so that they can watch germination and the first signs of growth for themselves. We’re also including some math in this project, as we count, measure and graph our plant’s progress. You can record the full experiment in your nature journals. 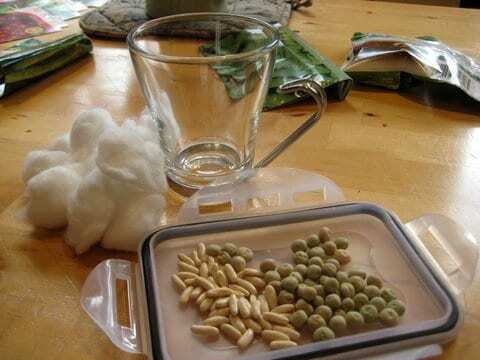 We use bean and pea seeds for our experiment. They’re big seeds which makes them easy to handle, and the different shapes make them an interesting contrast. They germinate quickly too, giving the children something interesting to see without having to wait too long. Whatever you decide to use, dampen it down with a little water, and pop your seeds inside. Place the seeds the edge of the pot so you can get a good view of them as they began to grow. You can ask the children to guess the answers to each question and record their predictions in their nature journals. 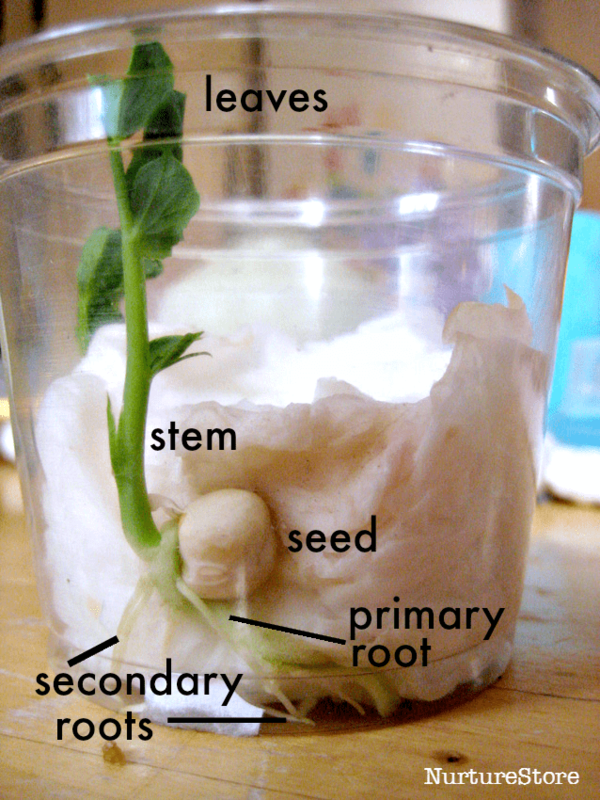 You can record your seeds progress in a number of ways, depending on how detailed your child would like to be. 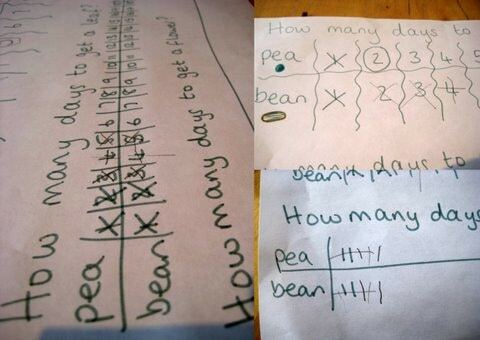 :: Older children can draw a tally chart, or a bar graph to compare a pea and a bean seed alongside each other. You can also make a graph with a x-axis showing the number of days and a y-axis showing the height of your plant. I wonder how the seed knows how put the root at the bottom and the leaf at the top? I wonder what happens if you turn a seed upside down when the root has just begun to grow? You can record all your investigations in your nature journal. I love the idea of a garden journal. I love your garden journal,what a great idea! 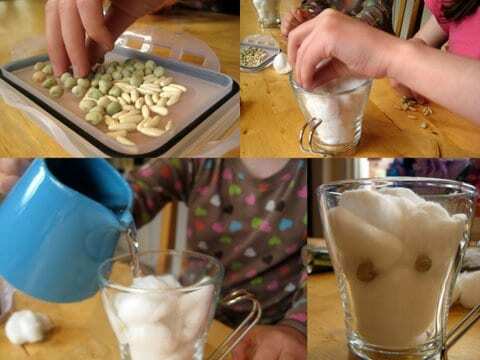 Looks like a fun experiment to grow seeds! This project looks wonderful. Love the garden journal too! Letting the kids see the process is a great idea! I love the charting it all! I probably have charted it before, but for some reason I like the way yours looks. I love this activity so much. Do you have any avaluation for this activity? I’m not sure what you mean B – what are you looking for? Great activity! Where would we keep the plant in the house? Hi Christine. We keep ours on the windowsill in the kitchen. It will grow towards the sunlight, so turn it round each day so it grows up straight rather than leaning towards the window.